A new proposal that would give more black and Latino students in Oakland access to the city's top public schools is getting support from the district's head of enrollment. The "opportunity ticket" proposal, raised at Wednesday's school board meeting, would amend enrollment policy to prioritize students currently attending schools that the district plans to close or consolidate, as part of its upcoming cost-saving consolidation plan. 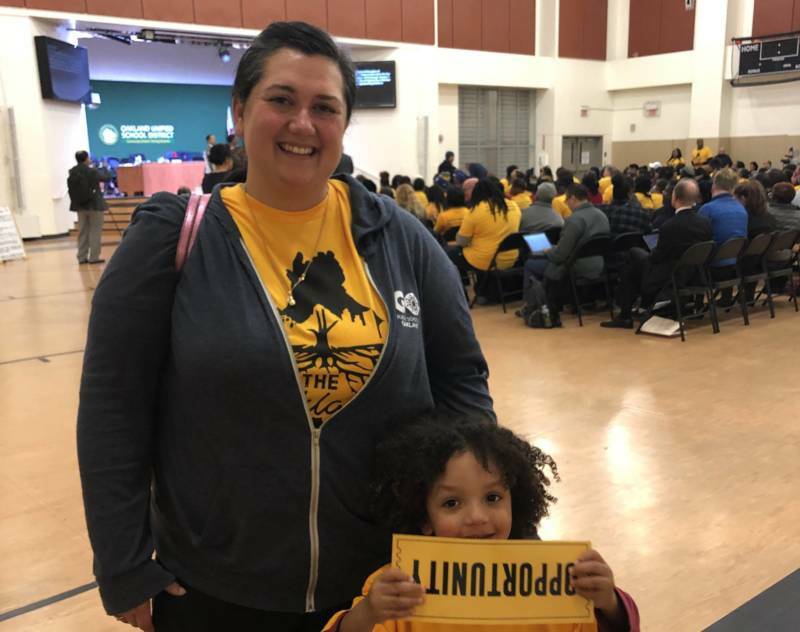 At the meeting, 150 black and Latino parents packed into the room holding giant yellow tickets emblazoned with the word "opportunity." "These schools have been failing black and brown families for at least 50 years," Lakisha Young, a parent who organized the group, told the board. "So you need to figure it out for real! OK?" That ticket would allow kids in schools slated for closure to get into any school they want districtwide. And late in the meeting Wednesday, the board decided to officially consider the idea next month. "The opportunity ticket is about finally saying ... that families who are going to be most negatively impacted and who are most often left behind, that those families actually have an opportunity and a pathway to a higher, better-quality option," said Young, who heads Oakland Reach, the group that introduced the proposal. It's a move that Charles Wilson, the OUSD's head of enrollment, sees as a way to create more equity in a district whose top schools still have a largely white student body. "Residential socioeconomic segregation is a problem all over this country," said Wilson, who attended the meeting. "This is just the beginning of a series of changes that need to be taken." Currently, priority for admission to OUSD schools goes first to siblings of current students, and then to applicants living in the neighborhood, with any remaining spots given to students from outside the area. But in the district's handful of coveted top-performing schools, there are rarely remaining spots. Supporters of the "opportunity ticket" proposal say it could potentially help desegregate some of the district’s most elite public schools, located largely in wealthier, majority-white neighborhoods. "One percent of black kids in Oakland attend a school that's above the state average and making progress," Dirk Tillotson, with the State of Black Education Oakland, an advocacy group, told the school board. "Two-thirds attend a school that is below the state average and going backwards. We do not have access to quality schools."